lt;stronggt;RCP2005CHAlt;/stronggt;lt;BR/gt;Rubbermaid-Chrome Heavy Duty Dust Panlt;BR/gt;Handy dustpan features a tapered front edge to help simplify sweeping-up. Heavy-duty, moderately flexible plastic provides commercial-grade durability. Lanyard handle-hole allows you to hang and store the pan out of the way. Material(s): Polypropylene; Width: 8 1/4quot;. 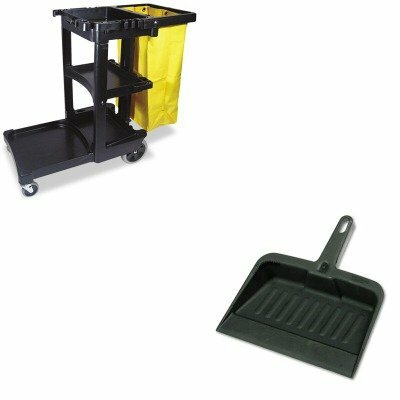 ~ Includes one dustpan.lt;BR/gt;lt;BR/gt;lt;stronggt;RCP617388BKlt;/stronggt;lt;BR/gt;Rubbermaid-Chrome Heavy Duty Dust Panlt;BR/gt;25-gallon vinyl bag attaches to handle. Three shelves for supplies hooks for mops and brooms. Platform holds standard size bucket supplies not incl.. Color: Black Caster/Glide/Wheel: Four Casters.